On the corner of Oil Center Drive and Harding Street, the old Paul's Jewelry Store Building. 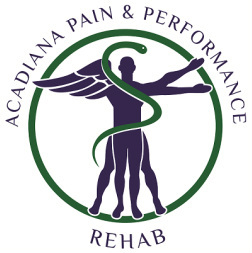 ﻿At Acadiana Pain & Performance Rehab, we want patients to be awed by the level of care they receive when they visit our office. Everyone should be able to do the things our bodies are des﻿igned to do: move, live and enjoy life. Pain makes it really difficult to do those things. That's why we hope to give true healing and pain relief to as many people as possible. We provide the highest level of natural pain treatments such as: Integrative Dry Needling, Osteopathic Manual Therapy, Functional movement re-education, advanced therapeutic mobility, Joint Manipulation, Active Release of Soft tissues, Vacuum Therapy, Perineural Stimulation and advanced pain modalities. We specialize in the treatment and resolution of headaches, spine and nerve pain. Including problems with tension headaches, migraines, neck pain, back pain, herniated disc, chronic pain syndromes, tendonitis, nerve injuries, TMJ dysfunction and running injuries. We also perform high level performance assessments and running clinics with slow motion video analysis. These allow us to create personalized plans to achieve your performance aspirations, whether they be improving to the top of your sport, getting back to playing golf or running without pain again. If you believe that we can help you in any way, please do not hesitate to contact us and schedule a free consultation. We look forward to helping you any way that we can. Derrick Hines, D.P.T., Cert. SMT, IDN, Diploma: O.M.T.